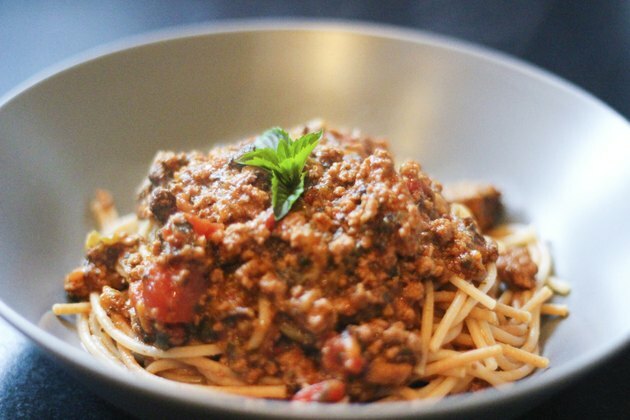 Can You Slow-Cook Uncooked Spaghetti with Sauce? If your family enjoys hearty, homemade spaghetti sauce, fitting it into a hectic lifestyle may seem impossible. The slow cooker can be a huge help in this area, allowing you to fix everything from roasts to chicken dishes to spaghetti sauces -- and now you can even cook the spaghetti in the same slow cooker, and at the same time, as your sauce is cooking. Slow-cooker recipes have come a long way since their early versions. Today's cooks have developed several easy ways to prepare the uncooked spaghetti in the same slow cooker as the sauce. This precludes the time-consuming step of bringing a large pot of water to a boil, then boiling the pasta. Older recipes may still call for boiling the spaghetti separately and serving the sauce over the hot noodles; some also call for boiling the noodles until not quite done, then adding them into the slow cooker with the sauce. To use uncooked spaghetti noodles in the slow cooker, prepare your favorite "from scratch" slow-cooker spaghetti sauce recipe according to the recipe directions. During the last 30 to 45 minutes of the sauce's cooking time, add the uncooked spaghetti directly into the sauce and stir gently. For very thick or meaty sauces, add an additional 1/2 cup to 1 cup of water at the same time you add the uncooked spaghetti. The added liquid will ensure there is enough moisture in the sauce to fully cook the spaghetti noodles. If your slow-cooker spaghetti sauce recipe uses prepared spaghetti sauce as its base, you will need to reserve some of the jarred or canned sauce until later in the cooking process. Set aside 1/2 to 1 cup of the prepared sauce called for in the recipe; mix the rest with the other sauce ingredients and cook as directed. During the last 30 to 45 minutes of cooking time, add the uncooked spaghetti noodles, along with the remainder of the prepared spaghetti sauce, to the sauce already in the slow cooker and mix gently. Make sure there is enough liquid in the slow cooker to cook the pasta. You may have to experiment a few times with your favorite recipe to determine whether you need to add the extra water mentioned in Step 2. If you are using standard-size spaghetti noodles, break them into 4- to 5-inch pieces before adding them to the sauce in the slow cooker. You can also use pasta shapes other than spaghetti, such as small shells, penne or rotini. These thicker pastas usually require 45 to 60 minutes to cook in the slow cooker -- slightly longer than most spaghetti noodles. How Do I Slow Cook Pasta?